My incredibly talented friend Jan Ring of Australia, now has a website!! Jan & I worked closely in the Den Education Center, where she wrote tutorials & hosted The Scrapsonian, sharing a wealth of information for digi-scrappers. I can't wait to see what she has up her sleeve. You can visit Jan's Dusty Digitals Blog here & her Dusty Digitals website site here. Bookmark both & check back often! 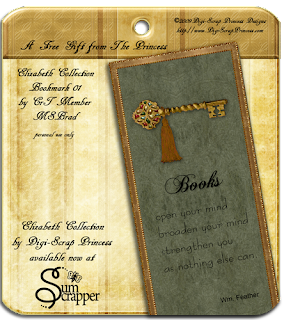 My CT member MSBrad (Michi), has created a beautiful bookmark gift for you using my Elizabeth Collection. 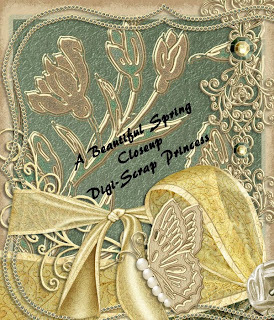 Thanks for sharing the beautiful bookmark with the digi-scrap family Michi! 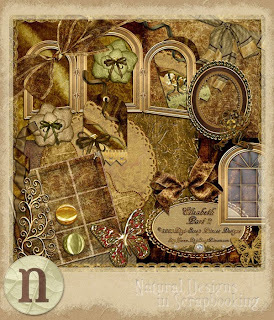 Click Here to Download this bookmark by MSBrad. Link will remain active for a limited time, so hurry to download your free gift. Elizabeth Collection Part I & Part II are available at NDISB. Coming May 1st - A Beautiful Spring, revised version. I've added a lot of new items to the kit & deleted several of the original pieces. You won't want to miss this gorgeous kit. 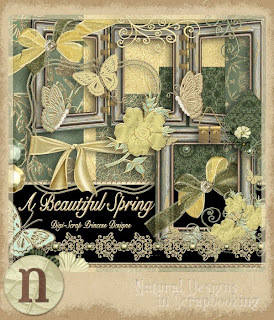 Watch my blog for A Beautiful Spring II Freebies! My Elizabeth Collection Part I has been such a hit & now you can purchase Elizabeth Collection Part II. Don't forget to download all the Elizabeth Collection FREEBIES on my blog! I would love to hear your comments on this latest release if you would like to share them on my blog. 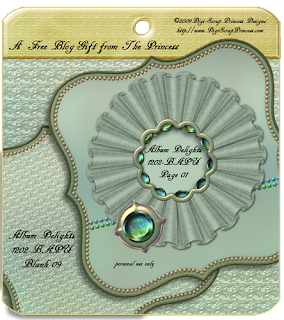 Click here to download 1 mini-frame, 2 buttons & 1 stickpin from me. 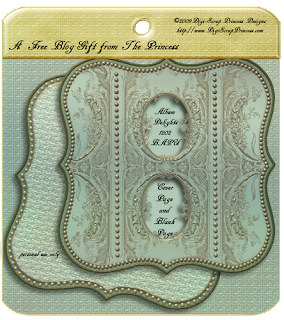 Also, my CT member Lella, has created a beautiful bookmark gift for you using my Elizabeth Collection. Thanks from the heart Lella for sharing your talents with us & sharing with the digi-scrap community. Link will remain active for a limited time, so hurry to download your gifts. Back by popular demand, I am refreshing the link to Charity Bookmark/Calendar. This bookmark was created with my Charity mega kit. Click Here to Download. Link will remain active for a limited time only, so hurry to download your gift. In celebration of the release of my Elizabeth Collection Part I kit, I wanted to share this Torn Paper 03 with the digi-scrap community. I would love to see how you use it in a layout & if you would like, you can add a link to your LO using this element in a comment. 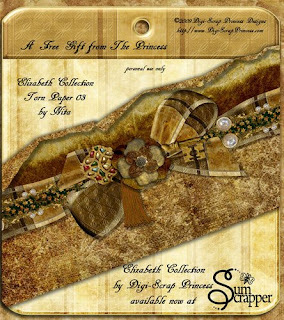 Elizabeth Collection Part I is available now at SumScrapper & NDISB. Click Here to Download Elizabeth Collection Part I Torn Paper 03. Link will remain active for a limited time, so hurry to download your free gift. You'll love the beautiful textures & metallics in my Elizabeth Collection. Perfect for heritage albums or special occasions. Watch for more of the Elizabeth Collection coming soon! After the DigitalDesignDen closed in March 2009, designer Sonya decided to open her own shoppe. I want to support the former Den Designers & enjoy working with them, so I joined them this week! 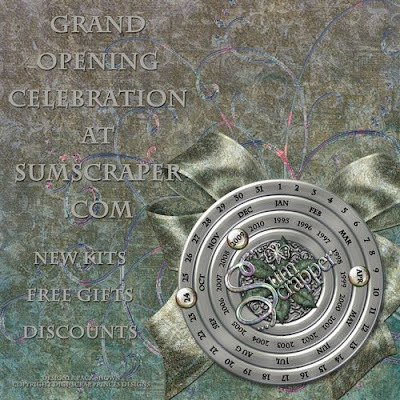 SumScrapper Shoppe is now open & I will begin adding some of my kits this week. Watch for our Grand Opening Celebration coming April 24th. You won't want to miss it! The items in the preview above are a sampling of some of the FREEBIES I will be giving away in the Shoppe & on my blog to celebrate. Join us won't you? 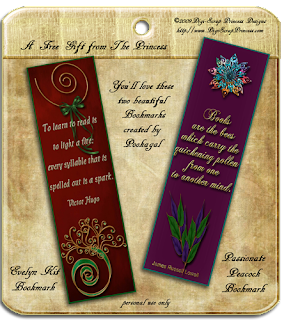 Creative Team Member Pookagal has created two beautiful bookmarks to share with you. 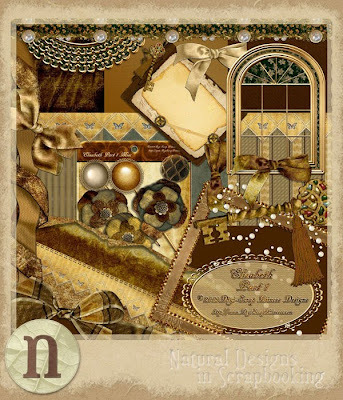 Thanks for sharing with the digi-scrap community Pookagal! Click Here to Download both bookmarks. Link will remain active for a limited time, so hurry to download your free gifts. 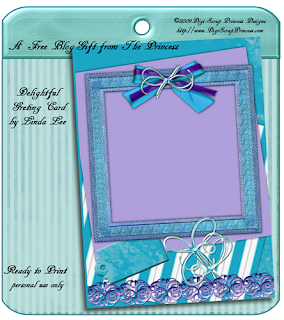 Today's blog gift consists of two (2) greeting cards using my Delightful kit. Thanks to Grace & Linda Lee for designing these delightful ready-to-print greeting cards to share with the digi-scrap community. I'm sure it would make their day if you leave them a little love after you download. Links will remain active for a limited time, so hurry to download these freebies while you can. Click Here to Download. The Cover Page and Blank Page complete the Album Delights BAPU-1202 Collection. Stay tuned next week when we begin a new Album Delights Collection. Click Here to Download Cover Page & Blank Page. Link will remain active for a limited time, so hurry to download your free gift. This 12x12 Quick Page coordinates with Album Delights Bracket Album BAPU-1202 & is for personal use only. Click Here to Download Album Delights BAPU-1202 12"x12" QP. Link will remain active for a limited time, so hurry to download your free gift. I hope you enjoy the Accessory Pack for the Bracket Album BAPU-1202 Collection. Not all items are shown on the preview - there are a total of 17 items in the zip file. This pack is for personal use only. Click Here to Download BAPU-1202 Accessory Pack. Link will remain active for a limited time, so hurry to download your free gifts. Three separate links for a total of six (6) Album Delights BAPU (Bracket Album Personal Use) pages. Links will remain active for 14 days. Be sure to check back later this week, as I will release the last four zip files to complete the BAPU-1202 set. Click here to download BAPU-1202 Pg 01 & Blank Page. Click Here to download Album Delights BAPU-1202 Page 3 & Blank Page. Click Here to download Album Delights BAPU-1202 Page 6 & Blank Page. Click here to download Album Delights BAPU-1202-Pg10 and Blank Page 3. The link will remain active for a limited time, so hurry to download your free gift. Check back weekly to download the remaining album pages (including covers) & Accessories Pack. 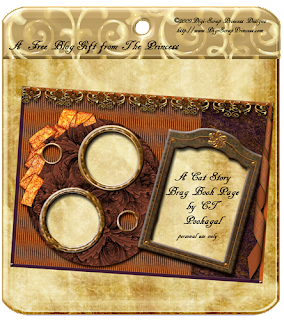 CT Pookagal created this lovely brag book page for you using my A Cat Story Collection. Thanks so much for sharing Pookagal! The link will remain active for 14 days, so please download ASAP so you don't miss it.